The oil industry is dead-serious when it talks about slashing operating costs and capital expenditures. It has to. Preserving cash is suddenly a priority, after years when money was growing on trees. In the US, the cost cutting has reached frenetic levels. 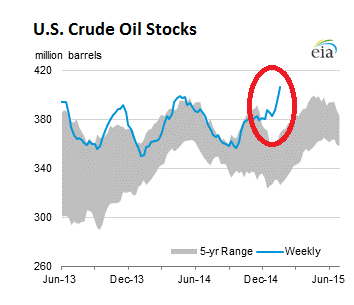 One place where it shows up on a weekly basis is the number of rigs actively drilling for oil. And that rig count dropped by 94 to 1,223 in the latest week, as Baker Hughes reported today. A phenomenal plunge, by far the worst ever. In January, the rig count crashed by 276, the most ever for a calendar month. That’s 18.4%! the rig count is now down 386 from its peak on October 10, by nearly a quarter! And yet, it’s still just the beginning. 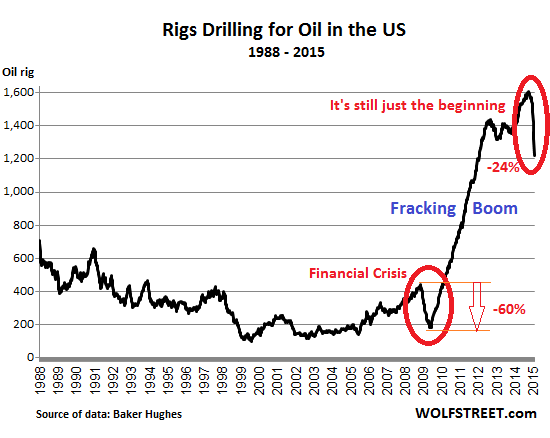 The chart shows the breathless fracking-for-oil boom that started after the financial crisis. Not included are the rigs drilling for natural gas. 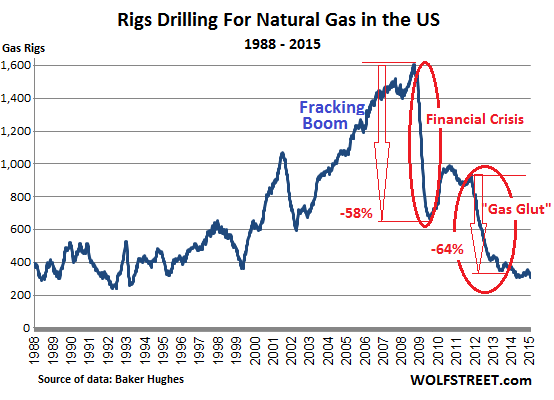 That fracking boom had started years earlier and ended in a glut and total price destruction that continues to this day (chart). Note the two-month cliff-dive, the worst ever. During the financial crisis, the oil rig count fell 60% from peak to trough. If this oil bust plays out the same way, the rig count would drop to 642! The bloodletting in the industry would be enormous. When the rig count was released today, West Texas Intermediate spiked nearly 9% to $48.32 a barrel, fired up by a big bout of short-covering. It now trades for $47.74, up 7.2% for the day. And yet, it’s still below $50! But the cutbacks in investments and drilling activities have not yet had any impact on actual production. That is a function of existing wells. New wells are constantly being completed, and their production adds to existing production. So what really needs to happen for the oil bust to end is a decline in production – because demand isn’t picking up the slack. But that just isn’t happening, not yet. Production continues to rise, internationally and in the US. Oil company by oil company, they’re all projecting further increases in production. They’re cutting drilling activities, they’re laying off people, they’re closing facilities, but they’re pumping as much oil as they can to salvage what’s left of their fizzling cash flow. 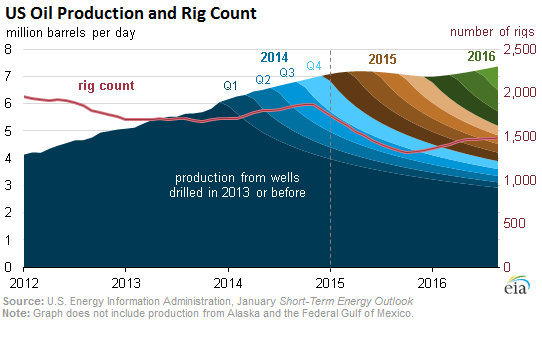 The US Energy Information Agency projects production from US wells (except from Alaska and the Federal Gulf of Mexico) to continue rising into 2015 with a tiny bit of tapering toward the end of the year. In this chart, which the EIA released on January 26, the maroon line represents the total rig count for oil and gas (rather than just for oil,as above). The colored areas (dark blue to green) represent production from new wells each quarter. Their drooping lines are a reflection of the steep decline rates inherent in fracked wells. In other words: new wells have to be drilled constantly just to keep production flat. If the rig count drops by enough, there won’t be enough new wells to make up for dwindling production from legacy wells. That’s when production will begin to taper off. Every rally in oil over the last six months has gotten hammered down brutally. Eventually, the oil glut will end. Everyone knows this. But we haven’t seen demand pick up or production decline to make a dent in the glut. And the wave of defaults and bankruptcies that needs to happen to shake out over-indebted, less efficient players has only just started. So it appears that folks who are trying to catch this falling knife may get some of their fingers sliced off. Good comedy watching the eager beavers trying to call a bottom again and again, each time getting bowled over by reality. This thing has much further to go before it turns around, and that’s only if it doesn’t drag the global economy into a depression first. In which case, even $45 oil will be far too expensive. This is the wave of defaults and bankruptcies on the CONSUMPTION side that is bigger than the wave of defaults and bankruptcies on the EXTRACTION side. The customers are just as over-indebted as the drillers, maybe more so. The energy-finance-distribution-retail-management-marketing bloodletting from this oil crash is just getting started. The result is lower prices to come. I do a lot of calculations for corporations based in future discounted cash flows valuations and hundreds of different metrics. Your numbers may or may not be on target. Only time will tell. I’ve been wrong on these things many times. But in this uncertain universe, one thing we know 100% for certain, like death and taxes: Germany will NOT invade Greece. So you can take that off your worry list. That was a bit tongue in cheek, but nevertheless there is great uncertainty yet in the politics of Europe and no one has a clue yet where Ukraine will lead. Can anyone point to a long term chart showing days of US oil consumption in US inventory? Is “days in inventory” at a near term record level? Here is an EIA chart of monthly oil consumption in the US – “petroleum products supplied.” Note that it is actually down since 2005 (more efficient cars, less driving, etc.) The chart is interactive, so actual numbers appear when you hover over it. Scroll down from the chart to get the data table. 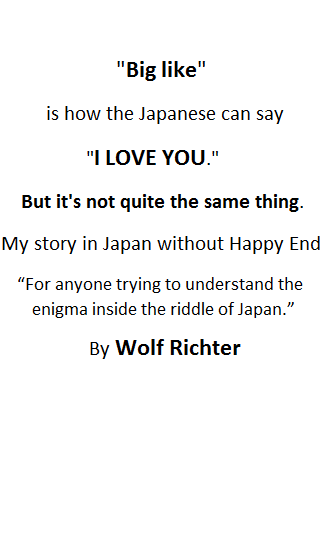 This might not answer all your questions, but it will get you a step closer.